Laura Ellman has deep ties to the 21st District and wants to put her problem-solving skills in the private sector to work to move Illinois forward. Laura grew up nearby, in Hanover Park, and graduated from Elgin High School. 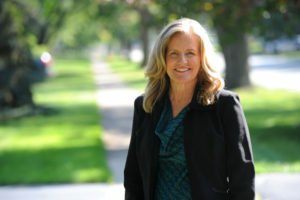 She has worked all over the district in Lisle, Warrenville, Wheaton, and Naperville. 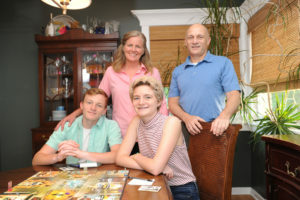 Laura currently lives in Naperville with her husband Pete, a musician, and their two children – Lizzie, a rising senior at Naperville Central and Barrett, who just graduated from Lincoln Junior High. Laura was raised in a working-class household in Hanover Park and Bartlett, and grew up believing that education and hard work were part of the American Dream. Laura has a love for learning and solving problems. She is the first child to go to college in both her parents’ families. After graduating from Grinnell College with a degree in mathematics, she earned a masters degree in applied statistics at the University of Iowa. As an assessor at Argonne National Laboratory, Laura Ellman knows what it takes to solve complex problems. Professionally, Laura has more than 25 years of experience working in manufacturing and engineering and dealing with regulations and policies. She is also dedicated to helping her community through her work on the Naperville Fair Housing Commission, Toastmasters, and as a volunteer with Habitat for Humanity, Feed My Starving Children, and as an ESL tutor. 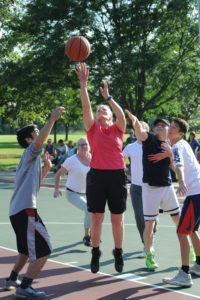 In addition to amateur woodworking and projects around the house, Laura enjoys sports—she’s been playing basketball every week for over twenty years, participates in triathlons, and ran a marathon (one was enough!). Laura and her daughter take their tent and bikes for a long overnight bike ride every October. Laura’s family also enjoys traveling all over America in their pop-up camper. Follow Laura’s campaign on Facebook!